You'll be £6.00 closer to your next £10.00 credit when you purchase Berlin Blockade. What's this? It is 25 years since the end of the Cold War, now a generation old. It began over 75 years ago, in 1944—long before the last shots of the Second World War had echoed across the wastelands of Eastern Europe—with the brutal Greek Civil War. The battle lines are no longer drawn, but they linger on, unwittingly or not, in conflict zones such as Iraq, Somalia and Ukraine. In an era of mass-produced AK-47s and ICBMs, one such flashpoint was Berlin. Allied agreements entered into at Teheran, Yalta and Potsdam for the carving up of post-war Berlin now meant nothing to the Soviet conquerors. Their victory had cost millions of Russian lives – troops and civilians – so the hammer and sickle hoisted atop the Reichstag was more a claim to ownership than success. Moscow’s agenda was clear and simple: the Western Allies had to leave Berlin. The blockade ensued as the Soviets orchestrated a determined programme of harassment, intimidation, flexing of muscle, and Socialist propaganda to force the Allies out. Truman had already used the atomic bomb: Britain and America would not be cowed. History’s largest airborne relief programme was introduced to save the beleaguered city. In a war of attrition, diplomatic bluff and backstabbing, and mobilizing of forces, the West braced itself for a third world war. 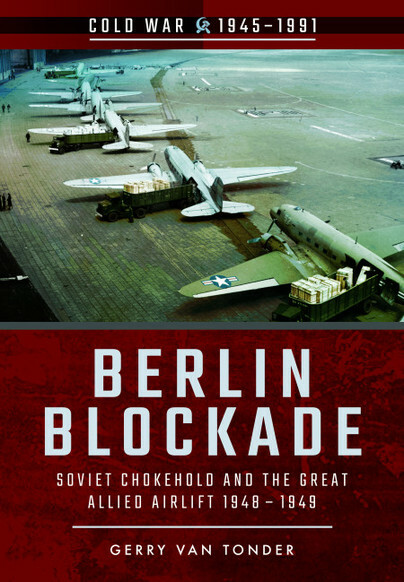 With excellent details encompassing the British portion of the airlift Berlin Blockade also highly details the American side. The book has beautiful colour graphics of the aircraft, maps and unit insignia's plus B&W photographs not seen in previous American publications. This book contains one of the best detailed descriptions of the black market and the value of cigarettes and how the Allies provided them in the tens of thousands. This a most excellent book about the RAF effort. Using many maps and vintage pictures, the author reports in depth the hard time the Allies had standing their ground to face their former partner, Staline who denied his previous Yalta position. Intimidations, brutal provocations, propaganda, and rescue operations (including the famous Berlin airlift), this is the first hot spot of the Cold War that is being told here in a new World order. This provides a useful introduction to the airlift that thwarted Soviet plans. Raised in Rhodesia, Gerry van Tonder in the late 1990s moved to Britain where he has written numerous military and historical works. Malayan Emergency is a second title he has in this Cold War series. His eminently readable account of the Berlin ‘moves and counter moves’ is punctuated by newspaper reports and letters of the day, topical photographs, excellent maps and compendium of the aircraft used and Allied military insignia. The visual section of the work is very complete, 100 photographs in black and white, 1 in colour and 8 colour plates in which we find maps, a collection of badges and various profiles of airplanes. A hot and hot topic about the end of the Cold War.